interpack 2017 – held May 4 – 10 in Dusseldorf, Germany – many of those solutions will be on display. 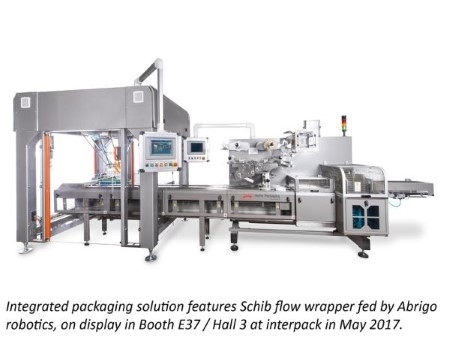 The robotic solution features a servo driven Schib CO 90 flow wrapper fed by a robotic cell with multiple picking tool. The Abrigo robot will be loading collations of five pre-wrapped snack bars directly into the in-feed chain of a Schib HFFS over wrapper. The packaging machine will be running 50 five-packs per minute. Automatic film splicing and Allen-Bradley controls are included in the machine setup. Hayssen technology on display in the BW Packaging Solutions booth include the Logic VFFS – with Doy, Quad and Zip capabilities – efficiently producing the most popular bag formats throughout the various major industry segments. The operational efficiency is enhanced by easy changeovers. Bag format change overs are a matter of minutes between simple format size changes, to a more complicated bag format such as Doy bag with zipper or Quad seal stand up bag with zipper. “The Merlin Blu flow wrapper, with its straightforward setup features, provides fast, repeatable changeovers for customers,” said Dan Minor, Hayssen’s Vice President of Sales and Marketing.